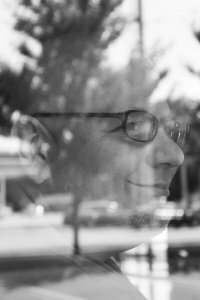 I am excited to introduce Joe DeRouen, the author of Small Things (volume 1) and Threads (Small Things) as my guest today. Joe was born in Carthage, Illinois, and currently lives in Rogers, Arkansas with his artist wife Andee, their son Fletcher, and their cats Lucky, Milo, and Camptown. Joe is a freelance writer and a substitute teacher at Benton County School of the Arts. In addition to writing, he enjoys purchasing (and occasionally watching) copious amounts of Blu-Ray discs, listening to music, playing video games, and collecting Mego action figures from the 1970s. Small Things is his first novel. 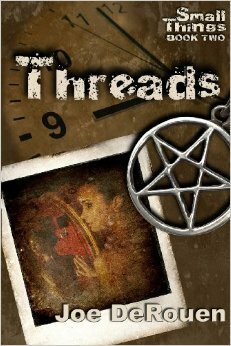 Threads, the sequel to Small Things and the second book in the trilogy, will be published sometime in late 2013. You can write to Joe at Joe@JoeDeRouen.com or visit his website at JoeDeRouen.com. Synopsis: It’s a hot June morning in a small Midwestern town when fifteen-year-old Shawn Spencer arrives at the church for his best friend Tanner’s funeral. Though his drowning was officially ruled an accident, Tanner’s sister Jenny swears she saw something rise up from the Carthage Lake to pull the struggling teenager beneath the surface. Shawn doesn’t believe in monsters… but he will… The real threat, however, lies in the man behind the monster, a mysterious old man who has vowed to settle an old grudge and regain something that was stolen from him decades earlier. To survive the dark days and nights ahead, Shawn must not only decipher what the man is after, he must move past his own grief, fears, and insecurities, and learn to trust in Jenny, the disgraced town sheriff, and, most importantly, in himself. The Small Things trilogy spans forty years and three generations in a tale of murder, betrayal, corruption, sacrifice, love, redemption, faith and magic that culminates in a showdown that will pit the very forces of heaven and hell against Shawn and his family in a battle for the future of mankind and the world itself. Synopsis: History is changing around nineteen-year-old Ben Spencer, and he’s powerless to stop it. His sister has disappeared, his family thinks he’s schizophrenic, and, worse yet, the girl he’s madly in love with won’t give him the time of day. Enter the mysterious Michael, who, years earlier, helped Ben’s parents defeat a powerful sorcerer bent on destroying them and reclaiming a relic stolen from him years before. With Michael’s help, Ben will travel back in time, to 1977, and attempt to set the past straight. But will he undo himself and the woman he loves in the process? 1. Briefly tell us about the book(s) you have published. 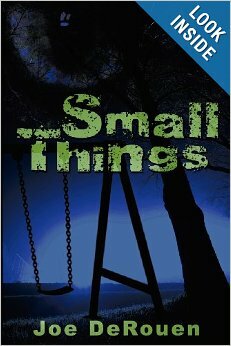 Small Things is a dark urban fantasy set in a small mid-western town in 1975 and tells the story of Shawn Spencer’s investigation into the death of his best friend Tanner, and his coming to terms with that fact that monsters are real and the humans behind them are even more terrifying. Threads, my second novel, is a sequel to Small Things. 2. What motivated you to write your book(s)? I was tired of carrying the stories around in my head. 3. What do you think your book(s) offer to your readers? 4. Who is your favorite character from your book? Why? Probably the emotionally damaged sheriff, Fred Ruskin, who years before the book takes place, lost his wife and daughter to a serial killer. There are many obstacles on his road to redemption, and we’re not sure whether or not he’ll get there until the very end. 5. Do you prefer pen/paper or the computer when you write? Computer, by far! Even I sometimes have a hard time reading my own handwriting! Mainly, just my computer and a quiet room. If I’m writing something that’s set in the past (and some of my books are) I’ll usually listen to music from that time period. 7. Do you prefer reality or fantasy? Can I cheat and say both? As far as writing goes, I enjoy fantasy, but fantasy grounded somewhat in reality. It needs to have characters that the reader can relate to. 8. Who are your favorite authors? Ken Grimwood, Charles de Lint, Jonathan Carroll, and of course the incomparable Rod Serling. 9. Out of all of the books you’ve read, which books have “stuck” with you? Replay by Ken Grimwood. I’ve read it probably a dozen times over the years. 10. What type of advice would you give other indie authors? Don’t give up, and write because you want to write, not because you want to get rich and famous. 11. Have you had any regrets regarding this writing/publishing/marketing process? Is there anything you would do different? 12. Since you started this journey in writing, what are some positives and some negatives you’ve encountered? Promoting myself. I’m absolutely awful at it! That’s the negative. The positive was how fiercely loyal fans can be if they enjoy your writing. I’ve met some amazing people, simply because they loved my work. There can be no bigger compliment than that. 13. What do you like to do when you’re not writing? Read, watch movies, listen to music, and more importantly spend time with my 11 year old son and my wife. 14. Tell us your most memorable or proudest moment. Honestly, writing and publishing Small Things. 15. Tell us something interesting about you that your readers may not know. I often have dreams that come true! 16. Finally, if you could say something to your readers, what would it be? Buy my books! 🙂 You won’t regret it!